Shine a Light: THE WEATHER ... having fun in spite of it. THE WEATHER ... having fun in spite of it. 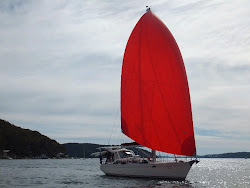 At our "picnic" with the Derwent Sailing Squadron on Sunday. The cold and the wet wasn't going to stop us hardy sailing types from drinking and eating! This morning we woke to a calm marina bay, glassy water conditions, bright sun and flawless blue sky. As I walked from our boat to the shower stalls people were standing out on their boats or on the walkways smiling and everyone commented on how wonderful the sunshine felt. This beautiful morning seems like it's been a long - long - time coming ... and everyone, including me, is well and truly OVER the wind and the drizzle. Normally I try to only accentuate the positive when writing this blog but I have to have just a little whinge first up about the weather. The wind has been the predominate factor in this whole Tasmanian adventure but the grey skies have also contributed to the growing frustration factor. There's been a very deep low off south-eastern Australia and it has meant wind and rain for a lot of the coast from northern New South Wales down to the southern tip of Tassie. Here we've had grey skies day after day but, for me, the westerly wind has been the killer. George and I have been lucky with our anchorages and with our trip back to the marina last Monday but so many of our boating friends have been caught out in uncomfortable conditions. Even here in the marina the wind is a part of everything you do .. or try to do. It is annoying. However, all the wonderful local people - on and off the water - say it will stop now. February and March are the months when the wind starts to behave and the sky clears. Summer will come. Any day now. Enough of that. On to the fun bits!!! Australia day celebrations in the little township of Nubeena! Over a week ago we left Port Arthur for the little township of Nubeena. We sailed back around the impressive cliffs of Cape Raoul - on a much calmer day - and up the western coast of the Tasman Peninsular. The little community of Nubeena sits beside a sheltered inlet called Parsons Bay. We liked it a lot and stayed there a week. It was very comfortable in the south-westerly winds. As we pulled into the bay, being careful to avoid the large fish farms all along the passage, we heard from our friends on 'Bogart' ... they were on their way around from Norfolk Bay to join us. Hooray! And then, as they arrived we saw 'My Way 2' coming in as well. Double Hooray! Even if the weather kept being bleak we would at least have some good social time. What we didn't expect was a full on Australia Day celebration the next day on shore. Australia Day - for those elsewhere - is the official national day to celebrate being Australian. Originally established to recognise the arrival of the first fleet ... Australia Day is meant to celebrate community and diversity in our nation of immigrants. However, as a footnote, to date the day doesn't pay homage to the original owners of the land unfortunately. But, me personally, I LOVE Australia Day and the way it brings communities together .. and usually out on the water. Being in Nubeena for their day was such a surprise, privilege and so much fun! Part of the celebrations in Nubeena was a cruise out of the bay on a replica tall ship. There were also kids kayak races and a sailing regatta. During the day on land there was an excellent art fair by local artists in the civic center/high school. food & wine vendors PLUS a terrific Aussie Band. The day there and night in the sports ground was FANTASTIC. The next day we all walked to the local pub which was a good piece away and a very welcome walk to stretch the legs. 'Bogart' left that evening to return to the marina in Hobart. Unfortunately they had to cross Storm Bay in winds forecast to blow 15 to 20 knots but, just like most of the conditions we've been experiencing, instead they battled 40 knots plus of hard driving cold winds. 'Southern Belle' and 'My Way 2' stayed behind to wait for a better forecast a couple of days later. We had all noticed a small restaurant on shore called Lucky Ducks. Our lunch, on the last day in Nubeena, was excellent. Good menu, food and a great wine list. Happy. So, the past week we've been back in the marina. Most of the RPAYC boats and crew are here as well and we've been enjoying what I consider the absolute best part of cruising - socialising! There's been drinks on board, meeting new people and dinners out. The best of times ... so good to be with the larger group. Last Friday night we all went to the Moonah pub not far from the marina. I suggested the venue - sight unseen - after looking around on line for someplace that could take our group of 18. Unfortunately as we were driving up to the front of the pub we noticed there was also a large group of very serious looking bikers arriving as well! Would this be Bikers vs Sailors? No. They went to the public bar and we went back to the very respectable looking dining room. Fun was had by all .. the food was remarkably good. And each group - although we only really met while ordering food - were very nice to each other. And finally ... sorry about the length of this post but I've been so lazy about posting that there's so much to tell! .... Yesterday our group were treated to a BBQ on the beach by the members of the Derwent Sailing Squadron. We were all looking forward to this. The DSS people have been very generous with their time and with inviting members of our group to join in their activities. They had promised free beer, oysters and salmon and a great day out months ago. Unfortunately the day was bleak weather wise. Rain, drizzle, wind, cold ... you name it we just about had it all. In spite of the prevailing wet stuff the BBQ went ahead. I had a great time, although at one time I thought it was the coldest I had ever been - in my life. George woke up with a cold and a bad cough so I went in the car with Peter & Debbie. We decided not to brave the conditions in the boat. I'm so glad I went - and that the event happened. As usual the people were good to meet and, again, apologised for the weather and promised February and March would be much much better. The fantastic beach and bay where we had the BBQ. This coming weekend the wooden boat festival starts in Hobart. The festival has become one of the major attractions for Tassie and we're all looking forward to it. And a final note on the weather. George and I are having a wonderful time. At the end of it all the weather doesn't matter. It's the people, the joy of sharing good times - and bad. And it's the place. Tasmania is just beautiful. Nothing has disappointed. End of the Road - BUT not for us!! !